You might already be familiar with Georgia Boys BBQ in Longmont. But you are likely not familiar with the company’s backstory nor with their new, expanded location. Georgia Boys owners Nick Reckinger and Matt Alexander got into the BBQ business in a roundabout way. Authentic Georgia Boys, it wasn’t until the pair were laid off from their jobs in 2010 during the Great Recession that they even considered cooking for a living. Because they knew good BBQ from back home and decided it was not being done well in Longmont, Nick and Matt decided in 2010 to start cooking BBQ in their apartment and selling it via friends and acquaintances. That strategy received a significant boost when Left Hand Brewery offered their parking lot as a fixed location for the two gentleman, which led inexorably to attention from the health department. Faced with the choice of going legal or getting another job, the duo rented a small, 1,200-square-foot house at 237 Collyer Street to sell their BBQ. Apparently what they did worked well, driving the company to #2 on TripAdvisor out of 223 restaurants in Longmont and to a brand new, much larger location. The new restaurant, at 250 3rd Avenue, is magnificent with loads of indoor space, a “fast casual” walk-up order window, a bar serving drinks and TV sports, and a very pleasant outdoor patio. The service is outstanding, with more than a handful of Georgia natives on the payroll. But it is of course the BBQ for which most patrons come. 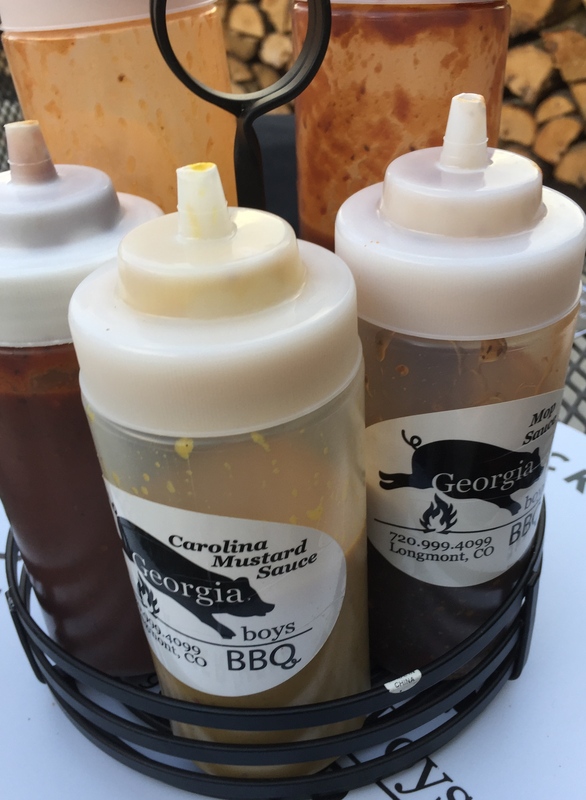 I asked Matt and Nick the secret to Georgia barbecue, as compared to that of Texas or the Carolinas. The response was Georgia BBQ is focused on the rubs and the sauces. Each meat they prepare (ribs, sausage, pulled pork, brisket, and chicken) is made with a different rub, each concocted with a wide variety of fresh spices. And when served, each is complemented with a sauce, about six of which are served on the table. I personally found the spare ribs the most delicious, requiring no sauce at all. 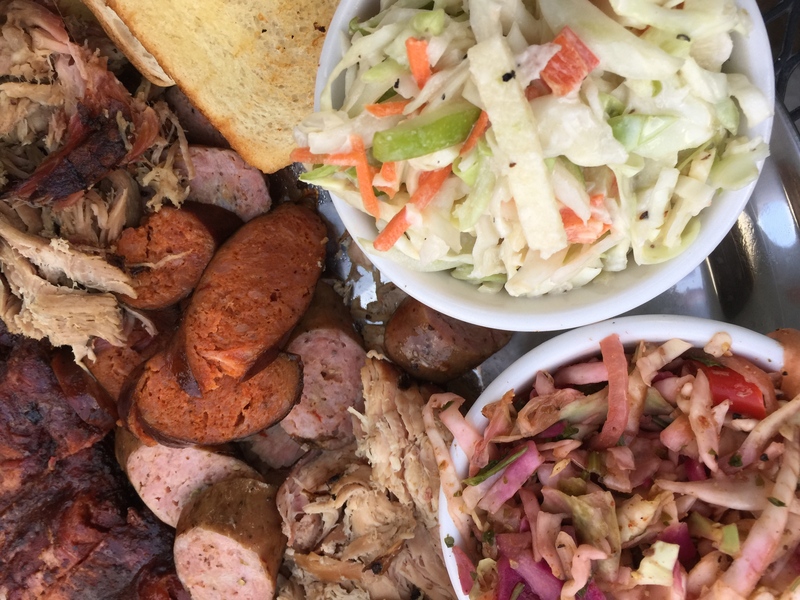 The combination “half sampler” platter accurately is described as feeding two to three people and gives you all the meat (and more) you could desire. Make sure to get the cilantro lime cole slaw and, when on the menu, the fried okra or collard greens. The Georgia Boys BBQ is definitely worth a visit in their new location on 3rd Avenue. Come for the BBQ, enjoy the atmosphere, and if you are lucky snag Matt or Nick for a story. The author was treated to a complimentary meal at the opening of Georgia Boys BBQ. The views expressed here are entirely his own. Just reading this made my mouth water…I need a mop, stat! Will definitely try this with a cold beer on their patio before this summer is done. Thanks for the review!